Are you an Estate Agent in Dorset, Hampshire or Wiltshire? Croft Preservation have a long-standing reputation with working with estate agents in both the Bournemouth and Poole area. Our services include conducting bespoke surveys, servicing, diagnostics and repair and boiler replacements amongst others. For Bournemouth estate agents, Croft Preservation provide peace of mind for handling a variety of property issues and can work effectively in occupied properties (both residential and commercial). Over the last 30 years, our experienced team have completed a variety of building projects ranging from minor repair work and dry rot repair to property extensions and full refurbishments. You can feel fully confident that your property repair requirements are in safe hands with Croft. From mould prevention and wet rot to damp issues, Croft Preservation are ideally equipped to provide an efficient and professional service. Croft’s highly skilled team will be able to visit the affected property where our team of experts will methodically examine the situation at hand and will recommend a suitable and cost-effective solution that works for you. Our expert team of specialists can work in both commercial and domestic properties and are able to provide a tailored approach to your property needs. 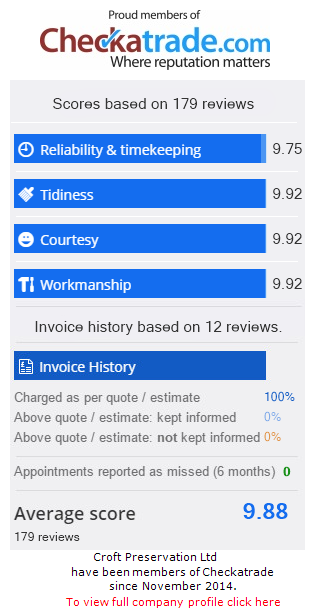 As members of Checkatrade, Croft Preservation have an enviable and renowned reputation for excellence in the Dorset and Hampshire area and have established positive and helpful relationships with many estate agents in the region thanks to our high-calibre work. Croft Preservation can tailor our building, maintenance and preservation services to the needs of each individual client, meaning every project is completely bespoke and the customer is always the top priority in everything that we do. ***For every successful referral from estate agencies, we will enter you into our prize raffle draw which takes place every three months. I was very pleased to be announced winner of the Croft Preservation prize draw. I was entered into the draw following a referral to another local firm. Croft have always provided a good quality service and workmanship along with all-important polite and friendliness to our clients. We would not hesitate to recommend them again and look forward to our continued involvement with the company. Joseph Mellery-Pratt AIRPM, Property Manager - Rebbeck Brothers, Bournemouth.